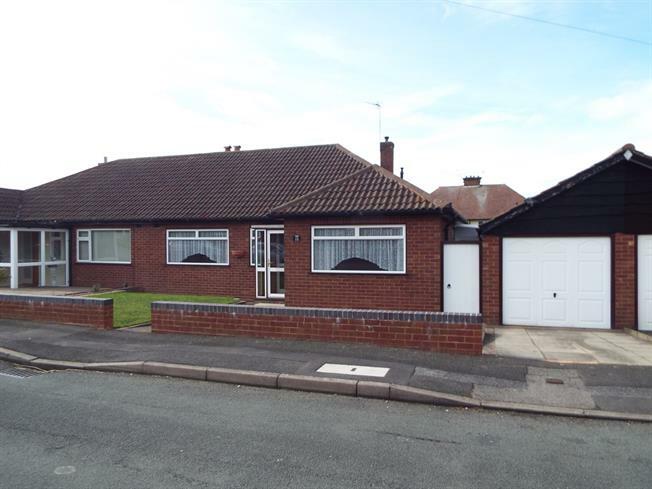 3 Bedroom Semi Detached Bungalow For Sale in Walsall for Asking Price £250,000. A well presented semi-detached bungalow benefitting from double glazing and gas central heating. The accommodation in brief comprises: entrance hallway, lounge, kitchen diner, utility area, WC, three bedrooms & family bathroom. Externally the property benefits from driveway, large side garage and well maintained rear gardens. Internal viewing is highly recommended to fully appreciate the size and condition of accommodation which is offered for sale with no upward chain. Double glazed window facing the side. Radiator, ceiling light. Double glazed window facing the side. Radiator, built-in storage cupboard and boiler. Low level WC, panelled bath, electric shower, pedestal sink. Sliding patio doors, opening onto the garden. Radiator and gas fire, ceiling light. Double glazed door, opening onto the garden. Double glazed windows facing the rear and side. Base units, single sink with drainer, two store rooms, door to side entry and door to garage. Double glazed window facing the rear. Low level WC. Up and over door to front, power and light points, window to side entry. Patio area, lawn, raised shrub borders, fenced surround.